The University of Sheffield is a World Top 100 University (ranked 75thin the QS World Rankings 2019) with a global reputation for research and teaching excellence. A member of the UK’s prestigious Russell Group, 99% of the University’s research is rated as internationally recognised, excellent or world-leading (REF 2014). The University welcomes more than 28,000 students from 144 countries. Teaching staff at Sheffield are globally leading with innovative approaches to teaching and learning. Many of them are accredited Senior, Principal and National Teaching Fellows, which means they’re recognised at a national level for their high quality teaching. Alongside its reputation for academic excellence, Sheffield is one of the world’s best cities for students (Student.com 2018). The University has been rated in the top five in the UK for student experience for the eighth year in a row (Times Higher Education 2018). In UK universities, the Students’ Union is the centre of student life and Sheffield's Students’ Union has been voted the best in the UK for ten years in a row (Times Higher Education 2018). Located in the heart of the campus, the Students’ Union has shops, cafes and bars, club nights every night of the week, a bank, cinema and more than 300 student-run societies. Home to more than half a million people, Sheffield is a vibrant major city with events and activities to suit every taste. Key events on the city’s calendar are the World Snooker Championships, a major music festival attracting more than 60,000 people and the UK’s premier documentary film festival. Sheffield has the UK’s largest theatre complex outside London and the world’s oldest football club. It is easy to get to most places in Sheffield on foot and there are student discounts on trains, trams and buses as well as in many shops, cafes, theatres and cinemas. More than a third of the city is in an area of outstanding natural beauty called the Peak District National Park which is a centre for cycling, hiking, climbing and paragliding. There are more than 200 parks, gardens and areas of woodland throughout the city including Endcliffe Park, Sheffield Botanical Gardens and Weston Park which is just a short walk from our main campus. Sheffield is also within a 90-minute drive of four airports with regular flights to destinations across Europe. The University guarantees to find you accommodation, providing you meet a few simple conditions. There is a range of accommodation to suit your needs and budget including catered and self-catered options. All University accommodation is within a short walk of the University campus. Sheffield is continually investing in facilities to offer the best possible teaching and learning experience. The Diamond is an £81 million hub with 19 specialist laboratories for engineering students as well as lecture theatres, seminar rooms and IT services. The University’s main library is open 24 hours, 365 days a year and has more than £1.3 million books and periodicals. The University has more than 3,532 study areas and more than 2,000 computer workstations. The University has excellent sports facilities including a multi-purpose sports hall, swimming pool, bouldering wall, four squash courts, a tennis court and cricket nets. If you would like to find out more about studying at Sheffield Unviersity, please contact one of our Across the Pond Advisors. This program is designed to train the healthcare workers, policy makers and scientists of tomorrow, and focuses on developing a better understanding of the global spread of resistance in order to limit the current and impending future threat of Antimicrobial resistance. The University of Sheffield welcomes scholarship applications for the 2019 entry from high-achieving students. You must hold an offer for a University of Sheffield course to apply. The University also participates in a range of prestigious scholarship programmes including Marshall and Fulbright. Ask your Across the Pond advisor for details. The Department of Mechanical Engineering at the University of Sheffield announces an Academic Excellence Scholarship for the 2016-2017 academic year. The Scholarship is worth £1000 per year in the form of a tuition fee reduction. Students will automatically be considered for the award if they meet the eligibility criteria. New Materials Science Course at Sheffield! The University of Sheffield announces an MSc Nanomaterials and Materials Science, new for 2016. The course is designed to equip students with the know-how and skills for becoming an expert in materials science with nanotechnology specialization. Students will experience the unique combination of a foundation semester in the general area of science and engineering of materials, followed by a nanoscience and nanotechnology specific semester to result in an unrivalled comprehensive nanomaterials expertise. California has been my home for 25 years and I wanted to be able to broaden my horizons and get out of my comfort zone by pursing a masters in a new country. The university provides loads of activities to help you meet people, and the people living here are very friendly and helpful. There is still time to apply for a fall 2019 start! 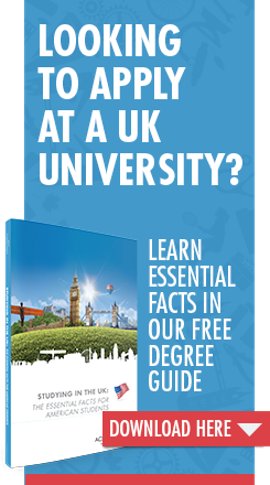 You could be a student in a British univeristy this fall.